Nicholas Stefanelli is the chef and owner of Masseria in Washington, DC. Stefanelli grew up in suburban Maryland with a strong influence coming from his close relationship to his Greek and Italian grandparents whose culinary heritage was a fact of life. Visiting Puglia, the source of his Italian roots, Stefanelli became enchanted by the masseria, centuries-old agricultural estates whose residents worked the land, created their own food, and hosted visitors, neighbors, and friends with great warmth. Striking out on his own and building his culinary career in the Nation’s capital, Stefanelli was determined to recreate that sensibility in his first establishment. The result is Masseria. Eric Di Nardo’s passion for the hospitality industry began with a glass of Amarone in Verona, Italy during a semester abroad. Fascinated by the complexity of authentic Italian wines, Eric took the opportunity to immerse himself in local wine, food and culture. This never ending curiosity and eagerness to learn landed him in management and beverage director roles at top restaurants around the world. A veteran of the restaurant industry, Chef Ben Pflaumer has worked in top kitchens including Osteria Morini in Washington DC, Mica Restaurant in Philadelphia and a number of Vetri Family Restaurants in Philadelphia. Pflaumer was first introduced to the restaurant industry at the age of 14, working as a dishwasher at Roma Italian Restaurant in Dover, Delaware. His passion for the kitchen led him to pursue a degree in Occupational Studies for Culinary Arts at The Culinary Institute of America in Hyde Park, NY. Pastry chef Jemil Gadea is a native of Grand Rapids, Michigan and a graduate of that city’s Secchia Institute for Culinary Education. He has worked at Wolfgang Puck’s establishment in Downtown Disney and, in Las Vegas, at Spago, at Jean-Louis Palladin’s Napa, and at Picasso at the Bellagio. 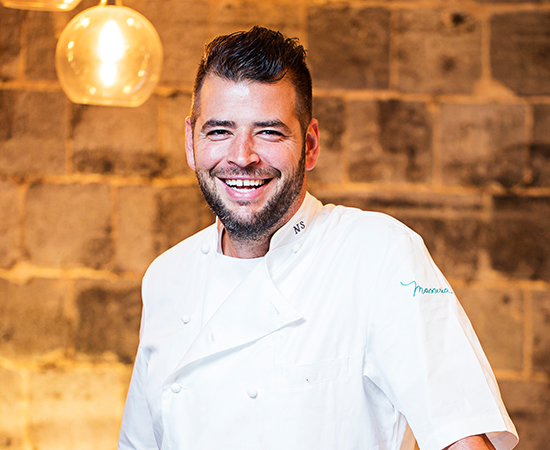 For over three years prior to the opening of Masseria, his desserts complemented Nick Stefanelli’s Italian cuisine at Bibiana. Advanced Sommelier John Filkins serves as Masseria's Beverage Director. John’s fascination with the wine world began while working at a local bistro during his undergraduate years studying finance at Loyola University. As John learned the foundations of his wine education, it was the experience of sharing that knowledge with customers that ignited a career-long pursuit of excellence in wine service.